What’s the future like, at the Vatican media? Does the reorganization of the Vatican media amount to Father Federico Lombardi’s soft demise? 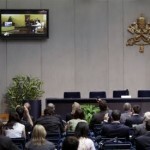 The director of the Holy See Press Office has lost the direction of the Vatican Television Centre (CTV), and has been assigned a second deputy at the Holy See Press Office. The new Vatican appointments are in addition to Greg Burke’s appointment last Spring as Advisor for Communications of the Vatican Secretariat of State. Are all these new Vatican communications postings directed at easing out Father Lombardi to a new position – perhaps as president of a Vatican dicastery, an Episcopal dignity, but no longer including responsibilities as director of the Holy See Press Office? Much remains «to be determined» regarding the new appointments. The new director of Vatican Television is Msgr. Dario Edoardo Viganò. Until now President of the Ente dello Spettacolo (the Foundation for cinema and audiovisual communications of the Italian Bishop’s Conference) and director of the magazine Il cinematografo, it is likely that Viganò has been chosen to bring new (cinematographic) modes of communicating to the Pope’s TV, which is increasingly oriented towards documentary work, at the expense of straightforward broadcasting. Angelo Scelzo, on the other hand, has been appointed Adjunct Vice Director of the Holy See Press Office (with TV and radio accreditation responsibilities). Scelzo was Under Secretary of the Pontifical Council for Social Communications. Until now, this Pontifical Council was in charge of TV and radio stations accreditations. Now, all of the accreditations will be issued by the Holy See Press Office, as it happened in the past and as Joaquin Navarro Valls (who was Lombardi’s predecessor as director of the Holy See Press Office) had never wanted it to be. How will all of this change the Vatican’s internal equilibrium? Since Greg Burke (an Opus Dei numerary) was appointed advisor of the Vatican Secretariat of State, Lombardi’s weight and impact have seemingly been on decline. Lombardi continues to face the press in briefings and speaking with journalists. But he finds himself sidelined in some initiatives. For example, when a text by the Pope is published in the Financial Times (FT). The English newspaper –a temple of lay thought– printed the Pope’s text on page seven (and a brief introduction in the first page), thus treating the Pope’s piece as any other of its op-eds. The operation was also strange in other ways: the Pope’s text did not seem to be written specifically for the Financial Times, it was not original (long excerpts of the piece were taken from the most recent book by the Pope, Jesus of Nazareth, and the very same text had been previously posted on the English speaking website Maronite Blog four days before its FT publication). Lombardi had not been alerted about publishing in the FT: when asked about it, he said that he had to ask for further information. Thus, Vatican communications moves along on a «stop and go» mode. 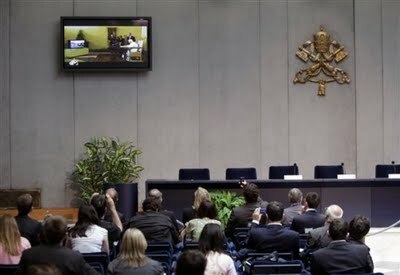 There is –it is rumored– a plan to place the management of all aspects of Vatican media under the Pontifical Council for Social Communications, which would stand above the Holy See Press Office (currently, the Press Office is under the Vatican Secretariat of State) and would become the point of reference on communications for all the Vatican dicasteries. But by whom would the Pontifical Council be staffed? With Angelo Scelzo out, what will be ultimately the role of Msgr. Giuseppe Vincenzo Scotti, Adjunct Secretary of the Pontifical Council and already also President of the Ratzinger Foundation and of the Superintendence Council of the Vatican Publishing House? Will Scotti keep his post at the Pontifical Council, or are other changes coming? One Response to What’s the future like, at the Vatican media? It’s probably worth mentioning that 70+ year-old Fr Lombardi is also Director General of Vatican Radio: is it surprising that his load is *finally* being lightened?